Is this the first real PC alternative to the MacBook Air? 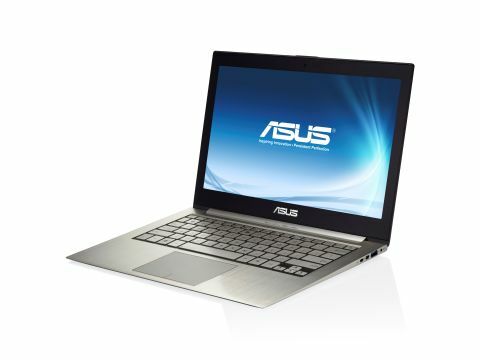 The Asus Zenbook UX31 is one of the first laptops to conform to Intel's Ultrabook specification. And, right away, we'll tell you - it stands toe-to-toe with Apple's MacBook Air in the fight for the title of best luxury ultraportable. Back to the present though and Asus has done a terrific job with the Zenbook's design - even if you have to acknowledge that the designer took more than a sneaky glance at Apple's ultraportable first. The aluminium silver lid boasts a distinctive concentric circle design that catches and reflects the surrounding light. Befitting the name, the Zenbook's simple, sleek finish gives it a premium look that keeps getting better as soon as you lift the lid. The design ethic is in evidence earlier than that, though - it's a lovely experience as you open the box while Asus has also included a mini Display Port to D-Sub adapter and a USB to Ethernet lead as well. Both are housed in their own little pouch. Better still, you even get a bespoke sleeve for your Zenbook in the box. The same thinking even stretches to the Intel Core and Windows 7 stickers. We wonder who it was that proposed they were silver and black - Intel? Asus? - but whoever did has made a difference.